Join AWL for a relaxing evening of networking and creating at Splash--A Painting Bar. 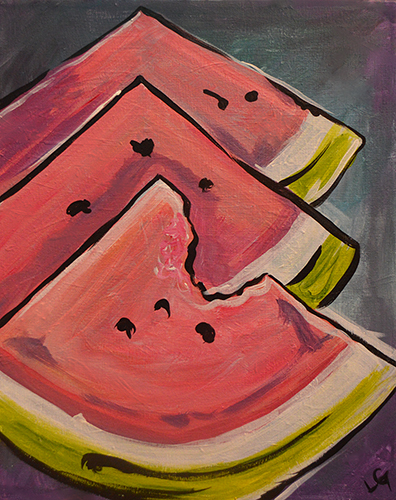 Guided by a local artist, you’ll create a piece of your own using this original watermelon painting as your inspiration, all while enjoying great company, snacks and drinks. No artistic skills required! Summer interns and other guests are welcome. $35 ($40 for non-members) allows you to create your own version of a painting to be selected soon -- check back for more details! The first hour will be dedicated to learning the artist’s methods and the rest of the session will allow you to expand upon your newly acquired knowledge and create something truly unique, all while relaxing and socializing with the members and guests of AWL. The cost for the event also includes light appetizers and one beverage. Reservations are required. Registrations made and not kept will be billed.